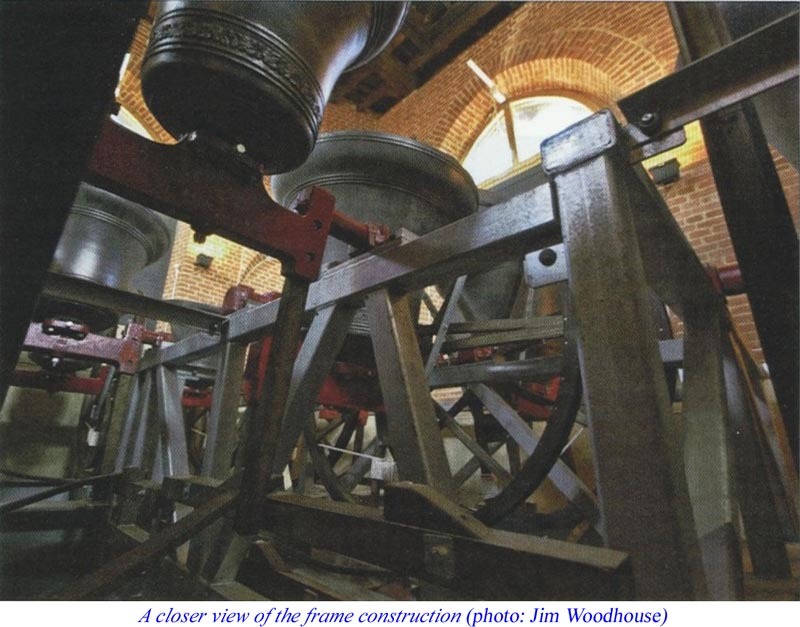 Last year’s project to install a new ring of twelve bells in Cambridge’s University Church was described by Gareth Davies in RW No.5136 (02/10/2009). This article describes in more detail the thinking that went into the design of the frame. 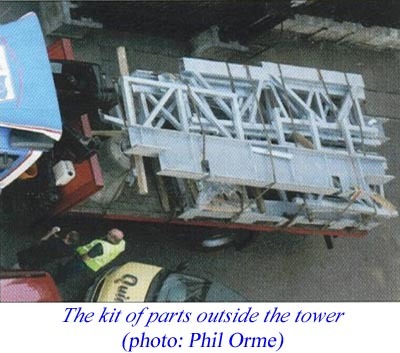 At the start of the project we had a difficult-to-handle 27cwt ring, and a report on the tower movement which concluded that to overcome the problem we needed to reduce the tenor weight to 21cwt or less. This being Cambridge, we got the University Engineering Department, plus science and engineering graduates among the ringers, involved in discussing other options. Hugh Hunt of the Engineering Department made new dynamic measurements, we contemplated but ruled out active and passive damping (i.e. having oscillating weights in the tower to cancel out the effects of the bells), and Richard A. Smith used his computer to simulate the effect on the tower of ringing changes at different speeds. Moving the bells lower in the tower was not a practical option, but we were able to show that orientating all the bells except the tenor to swing in the stiffer E–W direction would result in a worthwhile improvement. 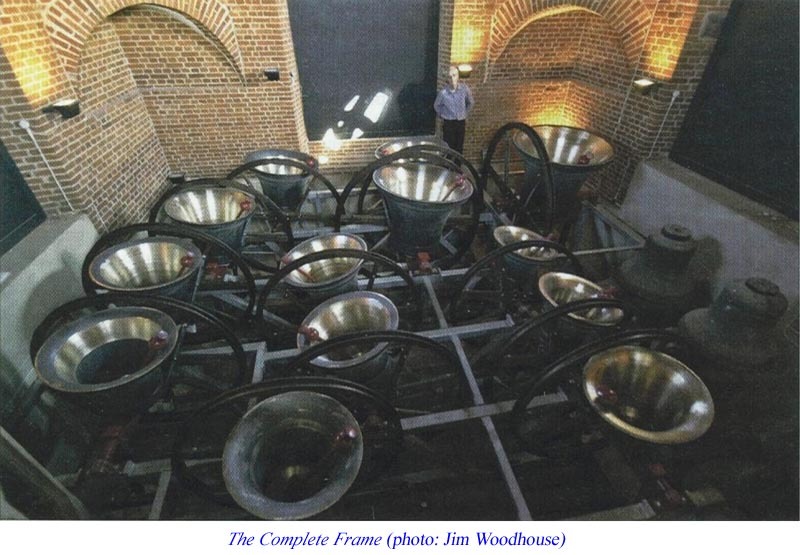 The N–S oscillations caused by the tenor might be significant, but would not result in unpredictable handling if there was no interaction with other bells. Based on that, we decided to adopt a 23–24cwt tenor in D for the new ring, copying the highly regarded new twelve at Trinity, New York, as closely as possible. The next question was what to do about the frame. The prevailing wisdom was that the existing 1953 low–side frame was satisfactory with no evidence of movement, but the layout we wanted required a new frame. Hayward Mills were approached, and suggested a suitable arrangement for 12 bells plus a flat 6th which would fit in the available space and leave room in the comer for the 5 old bells which we wanted to retain as the clock chime, plus the small priest’s bell which was the only existing bell listed for preservation. Their proposal was for a conventional frame on a steel grillage, not very different in concept from the 1953. frame. However, Alan Winter had produced a calculation demonstrating how a movement of the frame as small as 1mm when a bell is rotating at high speed can significantly increase or decrease the energy of the bell and therefore make its handling unpredictable. If the tower was going to sway about 1.5mm then it was clear that any horizontal frame deflection within the tower should be much less than that to avoid making the handling worse than necessary. Also, given that a bell is moving fastest when mouth down, the maximum centrifugal force acts downwards, and all the bells contribute to this regardless of their direction of swing. Hence vertical stiffness is particularly important, and it seemed clear that the frame should be designed for a maximum downward deflection well below 1mm. Calculations were needed, and probably a stiffer frame than usual to achieve a target 0.5mm deflection under maximum load in any direction. Frame design has hardly changed since Victorian times, and, being a civil engineer and used to designing economical modern structures, I wanted to have a go myself. By this lime our donor had made it clear that he wanted our frame to be supplied and installed by Taylors Eayre & Smith, and we were fortunate that their manager assigned to the project, Andrew Higson, was both willing to work to my design and very patient in answering my questions and helping me avoid any blunders. To get started we paid Hayward Mills a fee to use their proposed arrangement. The tower was accurately surveyed, and drawn on a computer using ‘AutoCad’. The approximate bell locations and an ideal rope circle were added, and then many minor adjustments were made to the bell and wheel locations to give as good a circle as possible without drawing the ropes. In the end 10 of the 13 bells were positioned so that the ropes could hang vertically from the wheels. Two others (2 and 10) have their ropes hanging vertically from twin pulleys below the wheels, and the flat 6 has a single pulley drawing the rope away from the wheel. This means that all the ropes hang vertically from their pulleys through the two intermediate floors. Some of the bells had their wheels positioned closer to the centre of the headstocks than usual in order to get the best possible circle, and these bells were drawn in cross–section at the wheel location to ensure that the wheel design provided enough space between the spokes. 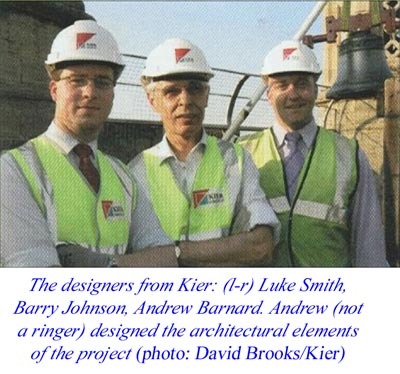 The framework was then designed to fit around the bells. 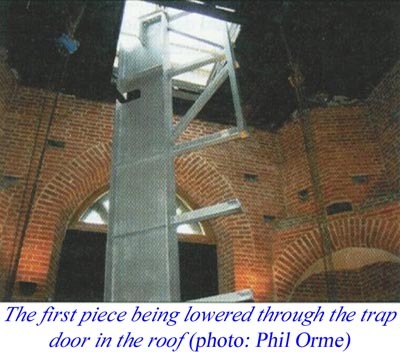 We had decided to keep the two primary E–W steel beams from the old frame which also supported the floor below the bells. The first computer analysis of the frame, modelling it as a 3-dimensional space frame, showed that these 18 inch deep beams were well below the stiffness required to meet the 0.5mm deflection criterion with all the bells acting together. The forces from the rotating bells were determined from the mechanics I had learned for A-level maths over 40 years ago. The deflection problem was solved by using two 27 inch deep beams, 2½ times as stiff as the old 18 inch beams, to span the tower in the N–S direction. These beams caused some raised eyebrows at Taylors as they are possibly the deepest they have ever supplied, but the improvement in handling appears to justify the design. The frame sides are made of steel hollow square sections with welded connections, apart from the bolted connections needed for assembly. The main departure from a conventional ‘pit’ arrangement is that instead of being symmetrical, each frame side acts as a truss spanning between the main beams, able to support bells at any point along its length. This reduces the complexity of the frame, and the stiffness is adequate in all directions without requiring a multiplicity of bracing members. There appear to be a couple of common misconceptions regarding the use of steel, and hollow sections in particular, in bell frames. One is that using steel results in a frame that is less stiff than one built using cast iron. While it is true that steel will deflect much more than cast iron before it fails, as a material it is actually about 20% stiffer than spheroidal cast iron. Deflection will only be a problem with a poor design that is too highly stressed. Typical steel structures are designed to deflect between 2 and 5mm per metre span, which is unacceptable for a bell frame. Therefore larger, stiffer, beams are required than is necessary for the load. The other misconception is that hollow sections ‘rust from the inside’. Hollow sections are in fact used in aggressive marine environments because of their resistance to corrosion, which is ensured by sealing the sections to cut off the supply of oxygen to the inside. This was originally the intention with the GSM frame, but because it was decided to galvanise it, the hollow members had to have a sufficient number of air holes to prevent pressure building up during the hot dip process. It is hard to convince galvanisers that welds are well enough made to resist the internal pressure when sealed tubes are heated, but with the holes, the galvanising also coats the insides of the tubes and should protect the steel for many years, particularly given that the previous steelwork showed little evidence of rusting after over 50 years. If painting were ever required, it would be best to fill the holes before painting the outside. The frame is not built into the walls in the conventional way. Packing around beam ends with concrete does not seem to be a very good engineering technique for transmitting load without movement, and has not always been successful. At GSM we are fortunate to have what we used to call the ‘ring beam’ but which is really just a bench in the wall where the thickness reduces from about 5ft to 3ft. The new beams sit directly on this, with grouted base plates to take the vertical load. Each base plate has 2 or 4 stainless steel anchor bolts, the holes for which were accurately set out and drilled more than 2ft into the masonry before the frame was delivered. ‘Cintec’ anchors were used as these are particularly good for transmitting load to weak or porous masonry. After the anchors and base plates were grouted, each bolt was tightened with a torque wrench to a tension of about 2 tons to ensure sufficient friction to transmit the horizontal forces to the walls. The torque wrench can be reapplied to check the tightness from time to time. The bolts used for connecting the frame components together should never need re-tightening. These are ‘Tension Control Bolts’ a modern type of high strength friction grip bolt which is tightened using a special tool until a part shears off when the correct torque is reached. This guarantees a very high tension and associated friction, enabling connections with 2 or more bolts to be designed as rigid. The aspect of the frame design which has caused the greatest amount of thought and discussion is the absence of plan bracing. Generally with a bell frame the horizontal forces will either be transmitted by the grillage beams pushing directly into a wall (i.e. the E–W horizontal forces would act on the E and W walls causing them to flex) or else plan bracing will turn the beams into a horizontal truss which applies the horizontal force in a direction parallel to the plane of the walls (i.e. so that the E–W forces are taken by the N & S walls). The latter is better for the tower as the walls are stronger in that direction, but the desired result will only be achieved if the braced truss bends less than the walls when carrying the load. I suspect that this is not the case with the majority of frames. Our old frame had no plan bracing stiff enough to carry the E–W horizontal forces to the N & S walls, and with the 27cwt tenor swinging in that direction in the centre of the tower the forces acting on the E & W walls will have been greater than with the new arrangement. We had no evidence that the lack of plan bracing was causing damage to the walls or adding to the handling problems so decided not to provide any for the new frame, at least initially. Another reason that the new frame is better than the old in this respect is that the anchor bolts allow the beams to push or pull in any direction without movement (hence no possibility of a ‘battering ram’ effect) and transfer the load to more locations and help to maintain the square shape of the tower. Hugh Hunt has revisited the tower since the bells were installed in order to make new dynamic measurements. We attempted to determine whether there was any significant flexing of the tower walls which could be reduced by adding plan bracing. Hugh’s conclusion was that the only significant movement was the rigid-body motion of the tower with no flexing of the wall. The maximum movement of the tower due to ringing the 11th was 0.22mm, and although too small to be accurately recorded, the walls may have been flexing about 0.04mm or 1½ thousandths of an inch. This is too small to damage the walls or for normal plan bracing to have any useful effect. The frame itself was not particularly expensive, slightly less than a conventional frame, and would be cheaper if others were made to a similar pattern. The Cintec anchors were a significant cost, as was the design work which was carried out by Kier Engineering Services, with a large number of hours contributed free by Luke Smith (another GSM ringer) and myself. Accurate surveying and setting out (also by Luke and myself) were essential to the success of the project, and one of the most satisfying moment was watching the first main beam being lowered through the trapdoor in the roof and being installed in its final position a few minutes later with anchor bolts fitted and having cleared several obstructions with a millimetre or two to spare. 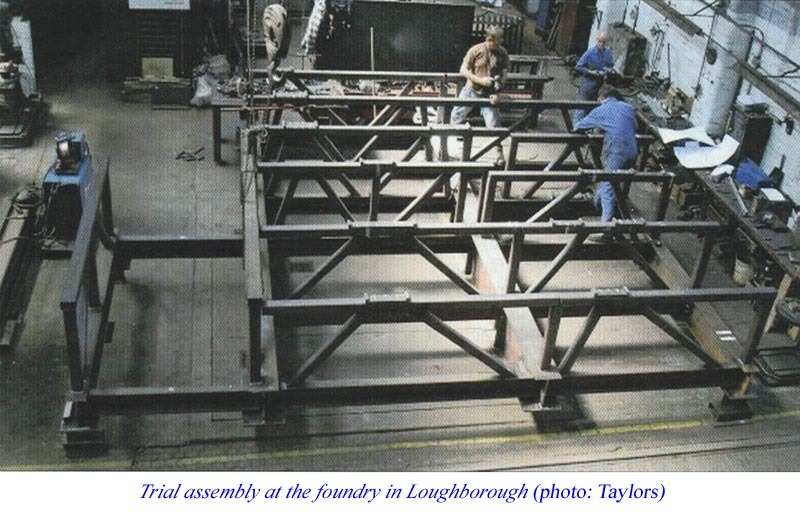 Equally important was the accuracy of fabrication at Loughborough and the trial erection in the foundry that enabled dimensions to be checked. The result is undoubtedly good, but I will leave it to those who can remember the old bells to judge the degree of improvement that has been achieved.